Instructions for making a range of custom parts for dolls house including opening and fixed windows, various styles of doors for shops and houses, staircases, tiny hinges and more. 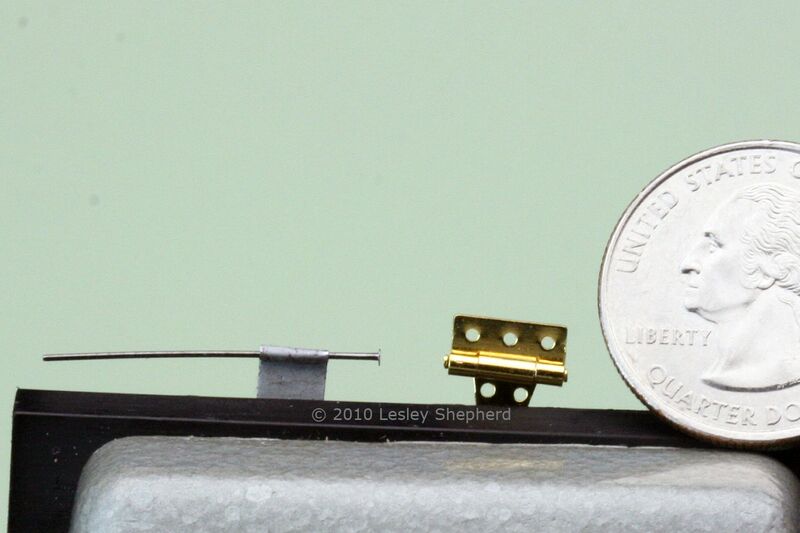 You can use the parts to complete a dollhouse or room box, add them to a backdrop or set for your fashion or play scale dolls, or use them for model buildings. These instructions will also help you copy existing windows to replace broken building elements of existing model buildings and dollhouses. Lesley Shepherd, Licensed to About.com Inc. Although you can now find a range of custom hinges for dolls houses online, it is sometimes easier to make miniature working hinges yourself of scrap metal or shim brass. These instructions show you how to make a simple hinge, which is smaller than most of the commercial dollhouse hinges you can buy, despite the easy method used to make it. You can combine the hinges with other metal parts to make hinged hasps or other parts which are hard (or impossible) to find. Use this tutorial to learn to make opening casement or awning windows, or fixed windows for a range of scale model buildings and dolls houses. The windows use thin plastic glazing and a 'sandwich' system of construction which allows them to be built with strip wood or heavy card, and common hand tools. Special moldings or a router are not required. The windows can be used for miniature furniture as well as buildings. They can be set into dining hutches or kitchen cabinets in miniature scales. The easiest windows to make for dollhouses and model buildings are windows which you fit directly into openings in the walls. This method uses strip wood and plexiglass, or acrylic, to make custom flat windows with a range of designs. Full glass doors are easily made from strip wood and perspex or plexiglass (Lexan) in most dollhouse scales. The instructions for this door also show the steps to hinge the door with pins and place it in a door frame with a transom window above. This method of making a glass door uses regular strip wood and does not require the use of special moldings or routered edges. This door is made with the same 'sandwich' technique as the windows, so it can be built without the use of a router or special moldings. The half window style lends itself to a divided panel base which is how this door is constructed. This system for making doors, like the windows, can use craft strip wood, or card depending on the scale of the doors you are making. With the card, you can make the doors for buildings 1:48 scale or smaller. Flat column finishes for shop fronts and traditional interiors are easily made from a range of scrap wood pieces and regular moldings. Choose your trims and style, and assemble columns to fit any scale of the model building. Beveled panels are easy to make in miniature scales and they can be used on everything from dolls house doors and wainscoting to tiny kitchen cabinets. This method shows how to make them from strip wood using a sanding block. This is a technique that can give you a range of ways to customize doors and walls for various period styles. You can use layers of foam core board covered with air dry clay to make faux stone stairs for model scenes, or a staircase for your fairytale castle. As they are made from foam core board in the correct thickness for scale stairs, little measuring is required, and you can set up half circular stairs or a spiral set of stairs just by stacking the layers of foam, making each step an equal distance back from the step below it. Lightweight stairs like this are easily moved, making them ideal for front opening dolls houses, where they can be set in front of the house and moved when you want to open the doors. You can build domes for most scales of model buildings using these simple techniques. The domes are shaped over a form using air dry clay or plaster over a base. Bases can be bowls, balloons or other easy to find rounded shapes, allowing you to make custom domes for almost every size of the model building or dolls house. You can set the domes on top of flat roof buildings, or use them on pillars to make garden pergolas.